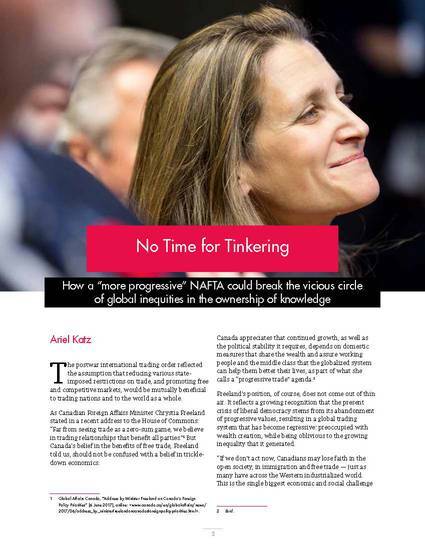 This essay, part of a collection of essays commissioned by the International Law Research Program at the Centre for International Governance Innovation (CIGI), discusses what Canada’s approach to intellectual property in the context of the renegotiation of NAFTA should be. Pursuing a “progressive trade” agenda, Canada’s Liberal government approach to international trade comprises two pillars: one, commitment to the postwar international trading order, which reflected the assumption that reducing various state imposed restrictions on trade, and promoting free and competitive markets, would be mutually beneficial to trading nations and to the world as a whole. Two, recognition that continued growth, as well as the political stability it requires, depends on domestic measures that share the wealth and assure working people and the middle class that the globalized system can help them better their lives. agenda, the essay argues that it warrants attention. The evidence from most reliable studies currently available fails to provide support to the claim that the expansion of IP has contributed to greater innovation, productivity or growth. Moreover, some signs indicate that the expansion of IP has already contributed to global economic stagnation, accelerated inequality and depressed wages, and that it already hampers governments’ ability to implement measures for countering those trends. - initiating a review of the current international IP frameworks with an eye toward scaling back some of its unnecessary and counterproductive aspects.